Know what you want to do but not sure what oilseed equipment you need? Whether you are processing oil for traditional uses or biodiesel fuels, using soybeans or babassu nuts, French’s proven technology can help improve your bottom line. We have processed innumerable oilseeds over our 115+ year history and our experienced team of engineers are ready to help discuss your application and help optimize your process. For more information on our Oilseed Screw Presses, download our free brochure literature. The two most common processes to extract oil for most seeds, beans, and nuts is the Full Press Extraction Process where mechanical screw presses are used to extract the oil by squeezing the oil under high pressure, and the Preparation/Solvent Extraction Process where a solvent is mixed with the material to separate the oil. 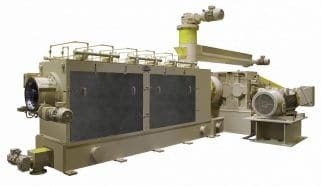 The Full Press Extraction Process is generally used for smaller capacity process, typically under 200 tons per day; and the Preparation/Solvent Extraction Process is generally used for larger capacity systems. French offers full press extraction equipment and systems, and the preparation equipment and systems required to prepare high oil content seeds and nuts prior to the solvent extraction process. In the Full Press Extraction Process, the maximum amount of oil is removed. In this process, the amount of oil remaining in the press cake (solids) will be in the range of 4-9%, depending on the material processed. The Preparation Process, prior to the Solvent Extraction Process, uses similar type equipment as the Full Press Extraction Process. However, when preparing the oil-bearing material for solvent extraction, the oil content in the material is typically reduced to a range of 18-20% residual oil. This material is then conveyed to the solvent extraction process where the remaining oil is removed to produce a meal with a residual oil content of 0.5% to 1.5%. Contact us to learn more information about our screw presses. French has experience in processing most oil-bearing materials including soybeans, cottonseed, canola seed, rapeseed, sesame seed, flaxseed, palm kernels, peanuts (groundnuts), corn germ, copra, rice bran, safflower seed, sunflower seed, castor beans, linseed, babassu nuts, tung nuts, walnut meats, etc. French offers a full range of equipment for the typical process to extract oil from most oil-bearing materials in the Full Press Extraction Process and the Preparation Process of high oil content seeds and nuts. Visit our Oilseed Equipment Designs page to learn more. The oil extraction process also requires auxiliary equipment including process tanks, pumps, instrumentation, conveyors, motor control center, electrical wiring and conduit, aspiration equipment, piping, air compressor, and storage bins and tanks for the raw material, filtered crude oil and ground cake. French can assist you in your equipment needs by supplying individual pieces of equipment and/or all of the major and auxiliary processing equipment.